Global connectivity has profoundly changed the way we do business today. Mobile connections are growing exponentially and challenging organizations to keep up and find new ways to target and reach their audience. However, with these challenges come great opportunities for new mobile and social marketing tactics, using mobile applications, NFC, mobile couponing and other technologies. Successfully deploying these mobile strategies will make or break companies in this connected era. 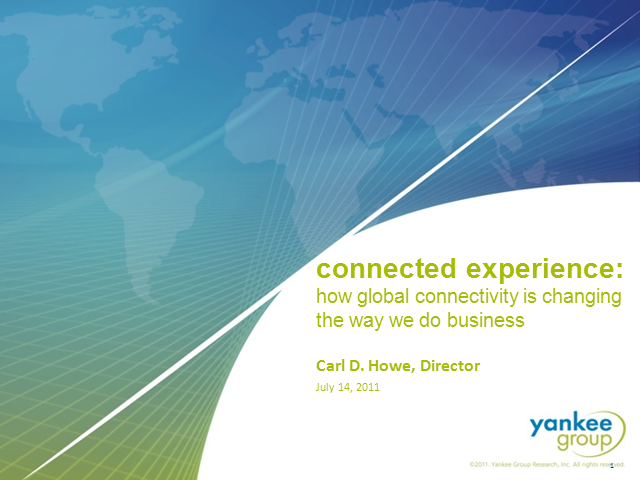 Yankee Group Director of Research Carl Howe will discuss the evolution of the connected user and what it means for business practice.